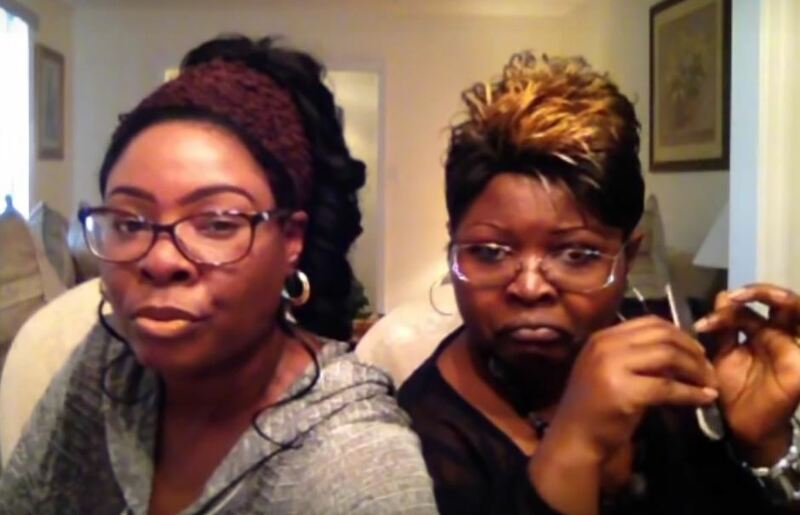 Diamond and Silk is a registered trademark owned by two sisters located in Fayettville, North Carolina who have been making public commentary on a variety of news stories since at least 2014 and having gone under previous pseudonyms such as The Viewers View and WeBeSisters on internet social media. They blasted to fame when their off-the-charts enthusiasm for Donald J. Trump running for President attracted millions of viewers. Their summaries are on point and entertaining with a unique style all their own that a befuddled media has no idea how to deal with. Diamond and Silk are a force to be reckoned with, having settled on their candidate of choice with a passion and conviction that stares would-be intimidators straight in the eye with priceless looks that could rival Clint Eastwood in Dirty Harry. Here we attempt to give readers the Best of Diamond and Silk, information about them and where to find what they're saying so you can judge yourself. Along the way, we are also going to report on the haters who are definitely not pleased about what Diamond and Silk are saying and do it through not-so-veiled racist mouths. It all started on July 15, 2015 when Diamond (Lynette Hardaway) created a YouTube Video calling out the media for their biased misrepresentation of Donald Trump's statements regarding Immigration. Diamond points out the clear distinction between legal immigrants and illegal aliens and chastises the media for their shameful conflating of terms that have nothing to do with one another. Diamond correctly points out that a legal immigrant is a person born in another country who has been naturalized through a process that afforded them United States citizenship by law after having gone through the proper legal channels required. An illegal alien is a person who thumbs their nose at the law, ignores authority, and saddles the nation with crime, welfare, illegal drugs and entitlements that society is unfairly prepared to deal with. Donald J Trump wrote: "When Mexico sends their people, they're not sending their best. They're not sending you. They're sending people that have lots of problems and they're bringing those problems to us. They're bringing drugs. They're bringing crime. They're rapists and some, I assume, are good people." Diamond's upset occurred when she turned on the News and realized that the media is in lockstep with the illegal activity that is causing this nation harm. She's particularly infuriated that the media is not telling the American public what's really going on regarding the problems attributable to illegal aliens. She is concerned that the voting public is being brainwashed against Donald Trump for his candid remarks and she compares the media's disingenuous reports with what was actually said. What was not being reported in the News was the introduction of Jamiel Shaw, father of a 17-year-old young man who was murdered in cold blood by two illegal aliens on March 2, 2008. At a Donald Trump Rally in Phoenix, Arizona on July 11, 2015, Mr. Shaw told the heart-breaking story of losing his son. Unfortunately, his story is only one of thousands. The sad truth is gun-control will only render the victims completely helpless as criminals smuggle in their own illegal weapons. This is one smart woman who has done her homework. The references within confirm everything Diamond has said. So when they come for your guns, while Hillary is demanding this country stand up against YOU, the law-abiding citizen, and shower border-jumpers with sympathy, rule that illegals be allowed to have weapons, the right to vote and entitlement programs, maybe the rest of us should start realizing that the guns aren't legal and the people carrying them aren't either. You'd have to register as well and match the mailing address.